Building on its successful outreach work across Wales and the South West, the Royal Welsh College is producing an ambitious new project to inspire school children to engage with classical music, reaching around 2500 5-18 year old school children across Wales over the next two years. Orchestradventure! And Orchestradventure on Tour!, specially devised workshops and large-scale concerts, will be presented by broadcaster and presenter Tom Redmond and the RWCMD Symphony Orchestra. Schools include Rhydri Primary School in Caerphilly, Ysgol Bro Sannan, Bargoed, Heolgerrig Community School in Merthyr and Llandough Primary in the Vale of Glamorgan. “Discovery, participation and learning are at the heart of this project. We hope that the concert will help the children to develop skills in listening, cultural awareness and social interaction, as well as inspiring both teachers and students to discover more about music and the performing arts,” says Kevin Price, Head of Music Performance. With funding from Arts Council of Wales and Western Power Distribution (WPD), a series of outreach and workshops in South Wales schools will take place in the autumn and spring terms of 2017/18. These will deliver the core skills needed to enable school children to gain the maximum benefit from their participation and engagement in the live Orchestradventure! performance in Cardiff in February 2018. Following February’s performance at St David’s Hall, Cardiff, the concert will visit West Wales in Spring 2018 and North Wales in Spring 2019 as Orchestradventure On Tour!, supported by The Prince of Wales’s Charitable Foundation. Orchestradventure! brings an unforgettable experience of live music in a large scale symphony orchestra to school children, often for the first time. It also nurtures College students as the next generation of educators. Discovery, participation and learning before the performance are at the heart of the project: the outreach and workshops delivered to the schools before the concert, along with supporting materials, will enrich the educational offer of the schools in Wales, supporting and enhancing the excellent work of local authority Music Services. This project follows the successful pilot concert in February 2017, supported by Western Power Distribution, when Orchestradventure! played to 1200 children in St David’s Hall. The Prince of Wales’s Charitable Foundation was founded by The Prince of Wales in 1979. It uses profits from the sale of Waitrose Duchy Organic, Highgrove garden tours and Highgrove products to give grants to a wide range of causes in the UK and overseas. WPD is the company responsible for electricity distribution in South Wales, the South West and the Midlands. Its role is to ensure the power network of poles and pylons, cables and substations – the infrastructure that we all rely upon to live our lives to the full delivers electricity to our homes and businesses around –the-clock. WPD supports around 400 charities and not-for-profit organisations every year. 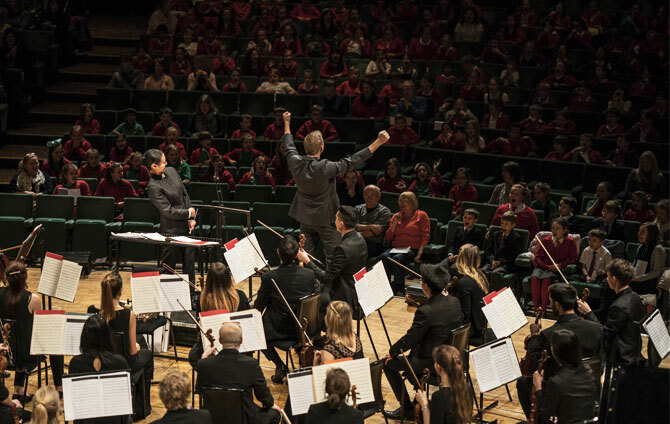 Projects such as Orchestradventure –provide a wide range of learning opportunities for pupils, by bringing live music into their young lives, helping them to learn new skills and be part of new experiences.